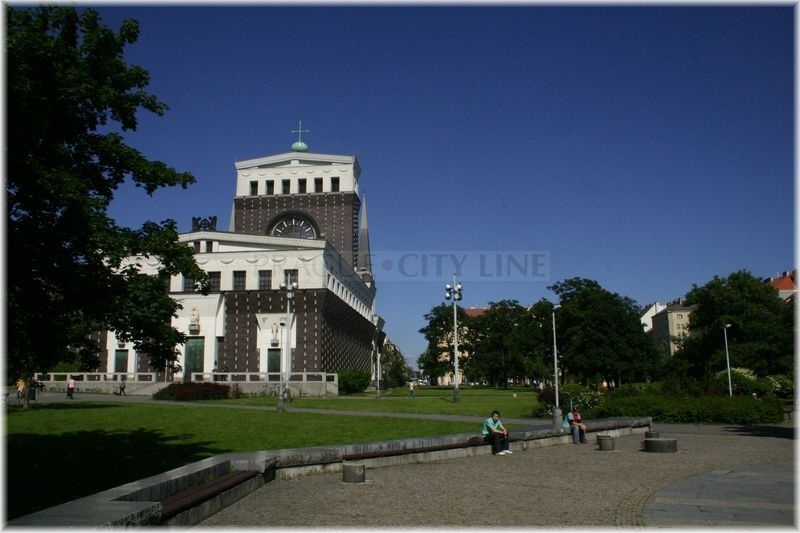 Again, we will visit Náměstí Jiřího z Poděbrad (Jiří z Poděbrad´s Square) where one of the main view points, Kostel Nejsvětějšího Srdce Páně (the Church of the Most Sacred Heart of Our Lord), is waiting for us. 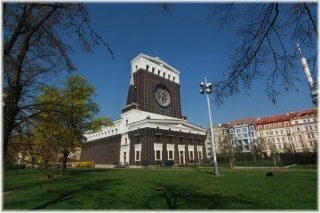 The church is a work of a noted architect Josip Plečnik who was also in charge of the reconstruction of Pražský hrad (Prague Castle). 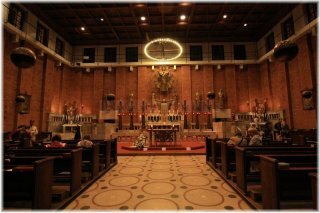 The Church of the Most Sacred Heart of Our Lord is by right considered one of the most significant sacral constructions of the 20th century. 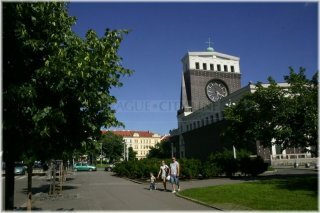 For a long time, the Church of St. Ludmila in the neighbouring Náměstí Míru had been the chief parish church of the Prague´s Vinohrady. However, the capacity of the church was not sufficient anymore, it was too small for so many people. So the municipal corporation decided to donate a plot for a new church. 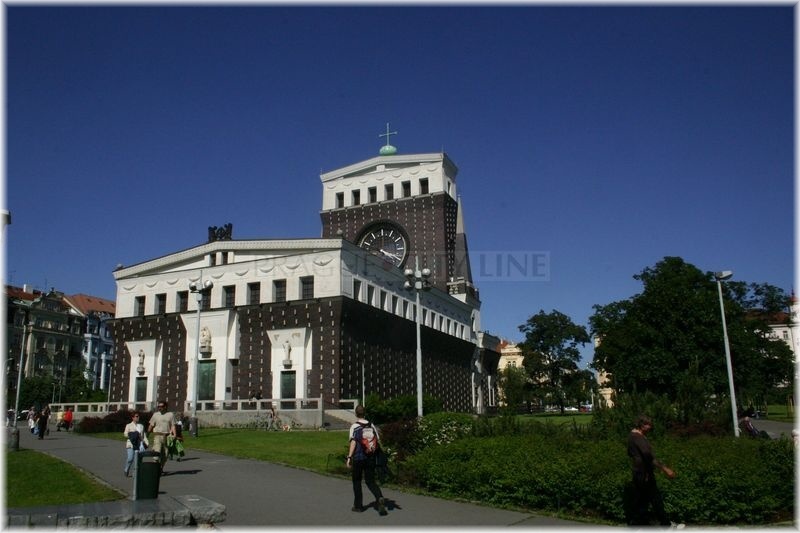 In 1919 the open tender for the construction of the church was won by the project of a noted Slovenian architect Josip Plečnik. We already know the name of this genius from our wonderings through Prague Castle because it was him who had carried out the contemporary appearance of Prague Castle (cze Pražský hrad). 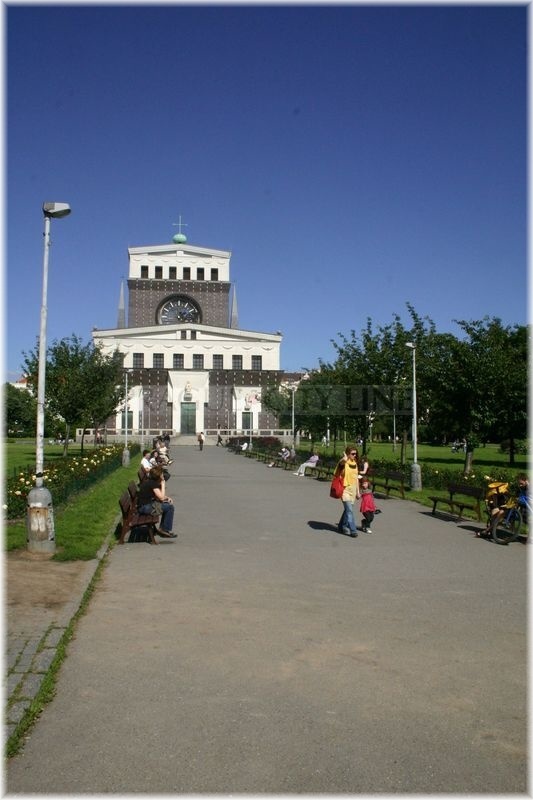 It was Josip Plečnik due to whom the reconstruction of the First and Third Courtyard of Prague Castle was performed and even the Southern Gardens were modified under his direction. 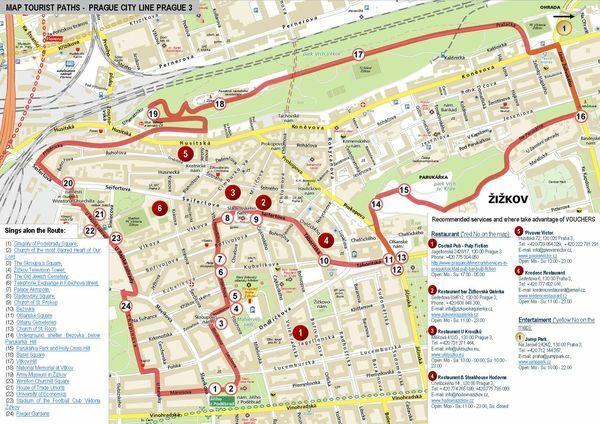 However, let´s get back to náměstí Jiřího z Poděbrad. 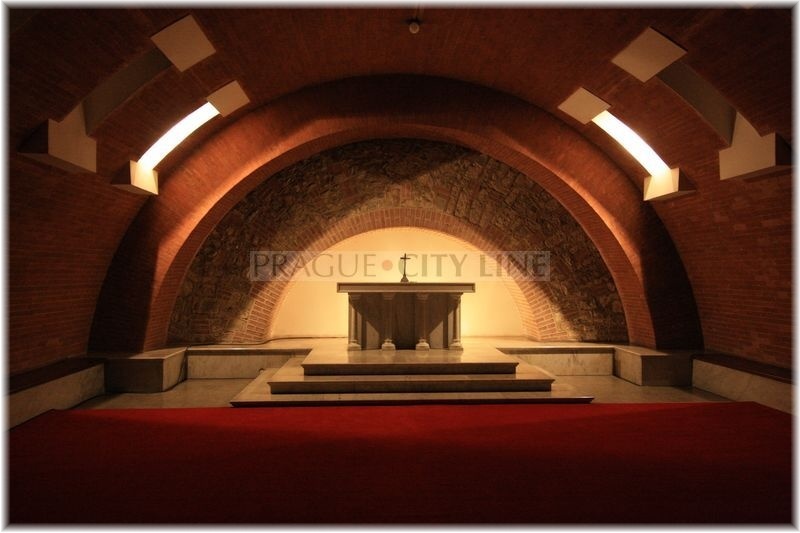 This remarkable, modern sacral structure was carried out based on this architect´s project between 1928 – 1932. 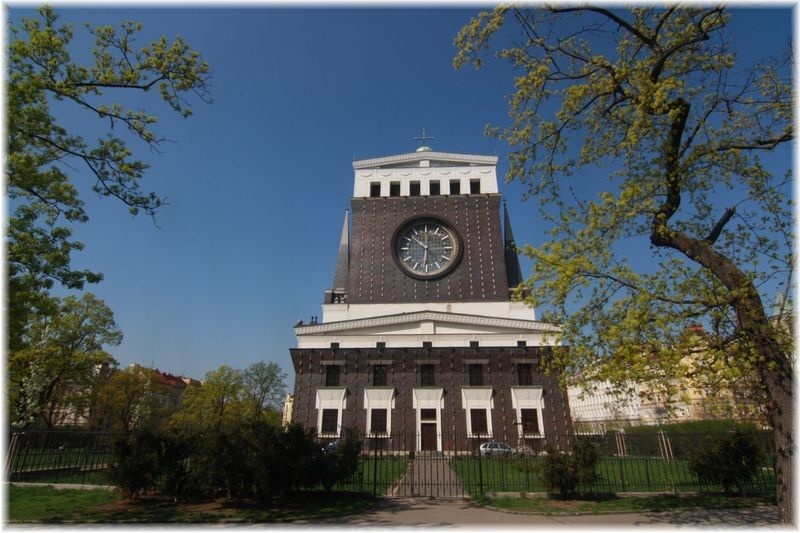 Plečnik found the inspiration for this construction in the Old-Christian models. The reason why the building was consecrated to the Heart of Jesus should symbolize gratitude for achieving the independance and a plea for protection of our homeland. The result of the construction was a structure with rectangular layout and a high cassette ceiling. 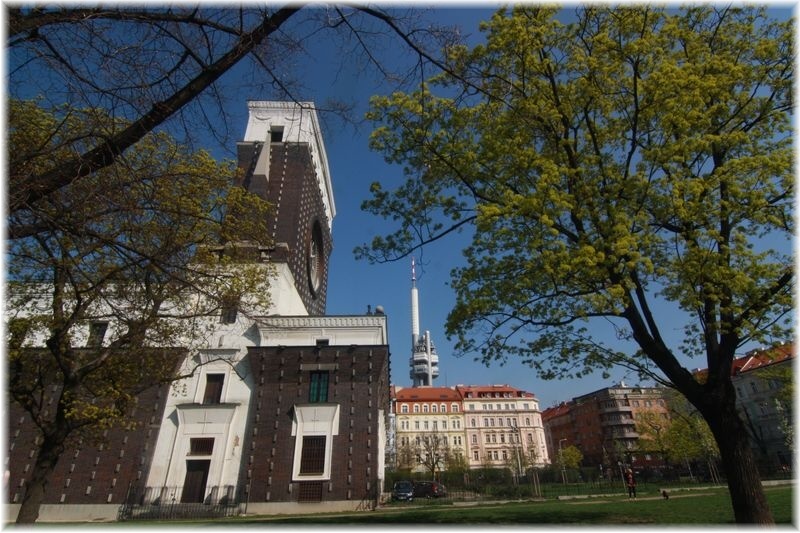 The dominating feature of the church is a wide church tower rising over forty metres high. It has a giant copper dome at the top of the tower which is fitted by a fout-metre cross. The tower clock with nearly eight-metre diameter is also exceptional. Yet the visitors are frequently enchanted by the uncommon appearance of the church. The church is namely up to three forths of height fitted by glazed bricks on which a gallery and a low gable are placed. The bricks on the facade are combined with blockstones of artificial granite which really makes exceptional impression. You will be further enchated by the front face of the church which is formed by three monumental portals whereas each of them is supplemented by statues. 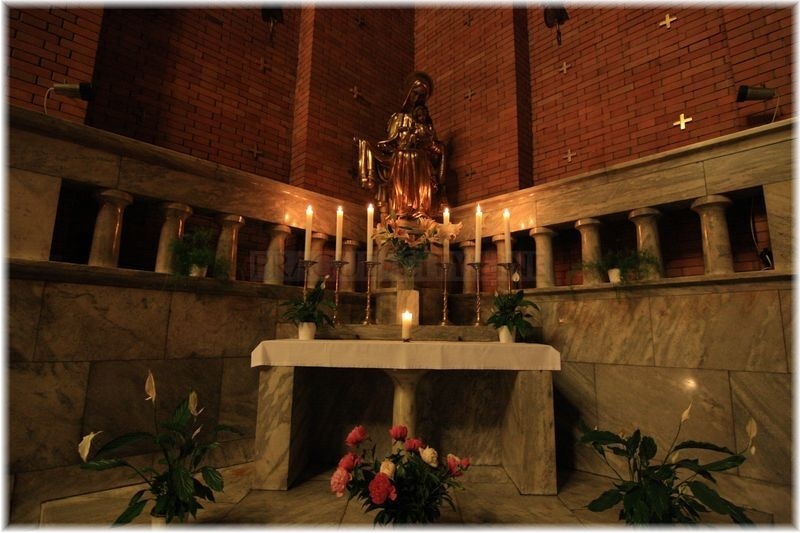 The main altar made of precious white marble is surely the view point of the church. The altar is supplemented and decorated by a gilded wrought door and there is a three-metre gilded figure of Christ and six statues of the patrons of Bohemia hanging over it. These patron saints are imaged in above life size. By the way, there is no single rostrum in the church. Church of the most Sacred Heart of Our Lord (Kostel Nejsvětějšího Srdce Páně) 50.078005, 14.450541 Church of the most Sacred Heart of Our Lord (Kostel Nejsvětějšího Srdce Páně) Again, we will visit Náměstí Jiřího z Poděbrad (Jiří z Poděbrad´s Square) where one of the main view points, Kostel Nejsvětějšího Srdce Páně (the Church of the Most Sacred Heart of Our Lord), is waiting for us. 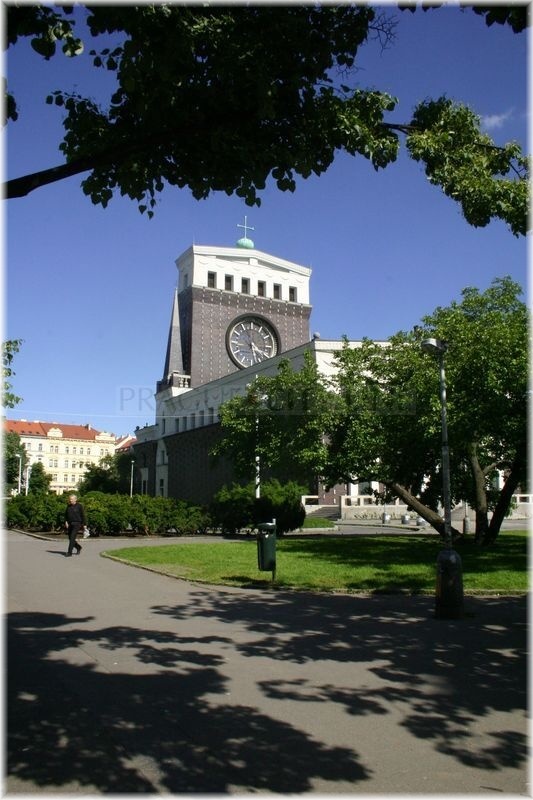 The church is a work of a noted architect Josip Plečnik who was also in charge of the reconstruction of Pražský hrad (Prague Castle).